Barthel Gernand is a Breton farmer taking refuge at Crestbridge Camp a little ways from his farm at Cropsford. Barthel, along with his daughter Callia Bincal and his son-in-law Aloys Bincal are having a little trouble with nearby goblins wrecking their new farms. Barthel wears a set of lower class clothing: a shirt with suspenders, belted braies and a pair of rough leather shoes. He also carries the cheap guide to Bravil and Leyawiin along with a small amount of gold. Barthel's schedule obviously depends on how far the building of Cropsford has progressed. Before the site is cleared, he sleeps from midnight to 6am in one of the tents in Crestbridge camp. For the rest of the day he either wistfully reflects on the joys of city life by reading the guides to either Bravil or Leyawiin; sits down and waits for something to happen; eats a snack; or just paces around the campsite. When the houses in Cropsford are finished, he will relocate to his new house. Once the goblins have been defeated, Barthel walks over to Cropsford to help with the building of the village. While the building is under way he sleeps in a tent outside the building site from 10pm to 6am, but once his house is mostly built he moves into it and sleeps there instead for the same period of time. For the rest of the day, his role seems to be overseeing the small vegetable patch behind the houses, and he paces around the area whenever he isn't sleeping. Speaking to Barthel Gernand for the first will have him greet you by saying: "What brings you into this goblin-infested wilderness, stranger?" Or if your disposition with him is greater than forty he will instead say: "Hello my friend. A word of advice. Watch for goblins if you're heading north." Regardless of how he greets you, asking him about goblins will have him explain his predicament. "Watch out for them if you're heading north. We ran into goblin war parties northwest of here, while starting to build a new settlement. My family and I are still trying to figure out what to do. We spent everything we had to buy the land and supplies, so we can hardly go back. Say, do you think you could help us? We need to get the goblins off our land so we can start building our new settlement." If you decline his request for assistance he will sadly accept your decision not to help him. "Oh. That's a shame. I don't see how three farmers can fight a whole tribe of goblins, but I'm sure we'll figure something out." Asking him about goblins again will have him once again ask if you will assist his family: "Yep, we're in a real predicament. Do you think you might be able to help us by getting rid of the goblins on our land?" Accepting his offer at any time will have him suggest that you go speak with Mirisa: "I had a good feeling about you, friend. You should talk to Mirisa about the goblins. She's our guide and knows what needs to be done." Ending your conversation with Barthel after you accept his quest will have him urge that you use caution while dealing with this problem as you part ways. "Take care, friend. Don't get yourself killed on our account." 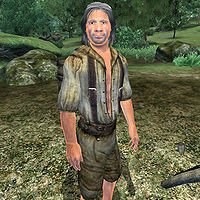 Starting another conversation with Barthel after speaking to Mirisa will have him remind you to tell him when it is safe to return to the construction site: "Let me know as soon as Cropsford is cleared of goblins, so we can get back to building our new settlement." Asking Barthel about his guide, Mirisa, will have him give a few more details on the Redguard's background: "She's a wilderness guide we hired to lead our expedition to Cropsford. Saved our lives when the goblins attacked." Asking him about the new settlement he is planning on constructing will have him reply by saying: "We plan to call it Cropsford. My daugher [sic] Callia, her husband Aloys, and I, came all the way from High Rock to start a new life here. We have a charter from the county, everything done official and by the book. I'm sure now that they knew all along that the land was in goblin territory. But no matter, who cares if a few settlers get themselves killed?" Asking him about Cropsford will have him point you in it's direction, as well as mark the location of Cropsford on your map. "It's northwest of here along the Yellow Road. You'll see some of our supplies near the road where we left them when the goblins attacked." Asking him about goblins again before you end the goblin war will have him ask if you've dealt with the problem yet: "Have you made any progress? Is it safe for us to go to Cropsford yet?" While he is waiting for you to deal with his goblin problem he will occasionally ask Mirisa if she thinks it is safe to return to Cropsford: "So what do you think? Is it safe to try to return to Cropsford?" To which she will respond by reminding him of the danger that occupies his home: "I wouldn't recommend it, sir. You don't want to put yourselves in the middle of a goblin war." He will respond to her recommendation by saying: "I'm sure you're right. You saved our lives back there. I'm just not ready to give up on our dream..."
Telling Barthel Gernand that you ended the goblin war will have him ecstatically thank you for saving the place he intends to make his home: "You took care of the goblin menace? That's great news, my friend! Now we can get back to building our new lives at Cropsford! Please, be sure to come visit us in a month or so. You have earned a hero's welcome!" Asking him about Cropsford again will have him remind you to visit them at a later date. "Come back in a few weeks. You may be surprised at what we can accomplish." After ending this conversation he will call out to his family to pack up and head to their new home: "Aloys, Callia! He's/She's cleared the goblins from Cropsford for us! It's safe for us to build the settlement!" Starting another conversation with Barthel at this time will have him greet you by thanking you for your assistance: "You've given me new hope, friend. I really believe we can make Cropsford a home for ourselves." Speaking to Barthel at Cropsford after the first building is built will have him greet you by saying either, "What do you think, friend? We've accomplished a lot since you last saw this place." or: "I'm proud of what we've built here. You should be, too. Cropsford wouldn't exist without the help you gave us." Asking him about Cropsford at this point will have him say: "I'm happy with our progress so far. I feel better knowing that Callia and Aloys have a home again." After the second building is completed any further questions about Cropsford's progress will have Barthel reply by saying: "We're almost ready to start planting crops. Cropsford is really starting to feel like home." Once Cropsford is complete asking him about his home will have him ponder on what the future holds for Cropsford: "I won't forget your service to our new settlement. Who knows? One day Cropsford may be a thriving town, and all because of you."